About two weeks ago, while clattering away on a keyboard in our office, an unfamiliar twittering sound got my attention. A quick peek at the trees in front of the office window revealed the culprit, and then some! 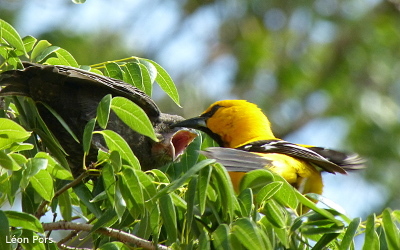 We have written about the Yellow Oriole (Icterus nigrogularis curasoensis) before (see this post, and this post), being the possible victim of the invasive Shiny Cowbird (Molothrus bonariensis), but the sight in the tree proved this hypothesis to be totally true, unfortunately. 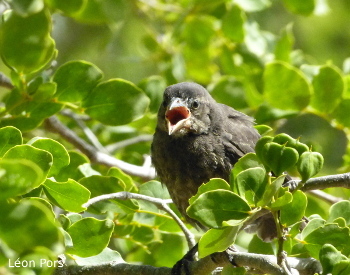 There it was, a Shiny Cowbird chick following a Yellow Oriole parent, while constantly begging for food. The parent had to work in overdrive, because the insatiable youngster did not allow for one moment of rest. And all this effort was basically in vain, only benefiting another bird’s offspring. The question remains if the local birds will find ways to counteract these, formerly unknown, acts of nest parasitism. Potentially they might, but with the inherently limited population sizes of small Islands it might be tricky. Only regular bird monitoring surveys might produce the necessary information to answer such questions adequately, and to allow for remediating actions, if found necessary. This, however, requires a long term nature management vision and policy, words that are only empty shells on the Island of Curaçao anno 2014.